Ancient Greece was a place characterized by knowledge, innovation, and an appreciation for the fine arts. Not unlike modern times, music was used as a part of religious services and on holidays to distract the people from their troubles and provide a few moments of peace. One of the most impressive innovations of that epoch, so impressive that we still employ it nearly 2300 years later, was the invention of the pipe organ. 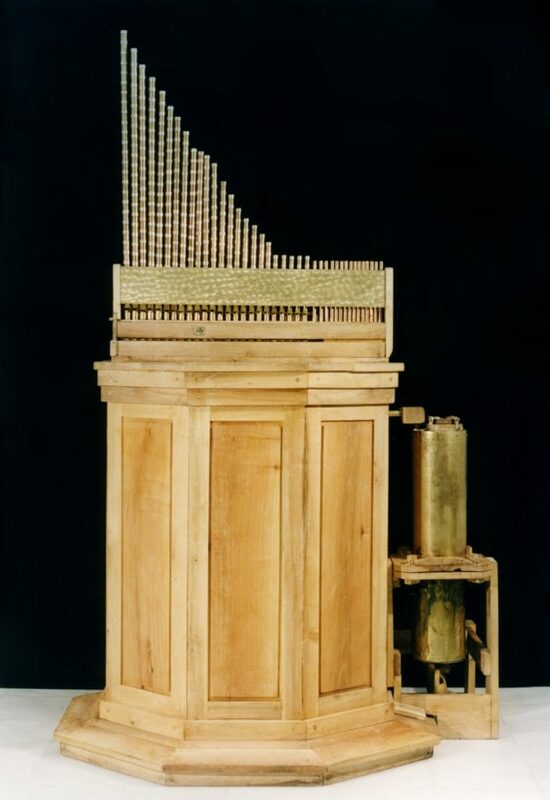 Late in the third century (c.270 BC), a well-known Greek inventor, Ctesibius of Alexandria, invented the hydraulis, the world’s first pipe organ and keyboard instrument (Britannica). The instrument’s name comes from the Greek words for water, hudōr, and either pipe or chamber, aulos or aulē (McKinnon). The hydraulis, or “water organ,” was an instrument that employed water to force air through its pipes (Britannica). Through studying surviving images of the invention in “mosaics, vases, coins, and sculptures,” experts have been able to make educated estimates about the dimensions of each hydraulis (McKinnon). These ancient pipe organs were a fraction of their contemporary descendants’ size at approximately 165-185 centimeters (5-6 feet) tall with an octagonal base measuring about 90 centimeters across and 30 centimeters high (McKinnon). A decorated brass cistern (60-90 centimeters) rested on top of the base with a cylindrical pump on either side (McKinnon). On the very top of the device rested the pipes which made up “a third to half of the total height of the instrument” (McKinnon) and a rectangular wind chest that was connected to a conical wind reservoir and received air from multiple pumps (Britannica). To create a steady air pressure, the open end of the conical wind reservoir was placed in a large exterior container partially filled with water (Britannica). When the air pressure dropped, the water would be pushed into the cone, which allowed each pipe to sound equally loud (Britannica). To play the instrument, the musician pressed keys or moved “sliders” that manipulated the air moving through each pipe (Britannica). In 1992, Greek archeologists, led by Professor Dimitris Padernmalis, unearthed fragments of an ancient Hydraulis from the base of Mt. Olympus (Pettigrew). The European Cultural Centre of Delphi decided to construct a working replica of the instrument using archeological evidence, knowledge of ancient harmonic preferences, and information provided by ancient artwork and literature (Pettigrew). In 1999, the modern hydraulis was finally completed and regularly makes appearances in places like the Acropolis Museum in Athens. When played, the instrument creates static tones with an airy quality, accompanied by the gentle gargling sound of the water pump. About the decision to attempt this historic construction, Dr. Richard Pettigrew, President of the Archeological Legacy Institute, shared that one of the many purposes of archeology is to appreciate the “diversity of human cultures” throughout history and to seek out connections with our ancestors. The remains of the ancient hydraulis are currently on display at the Archeological Museum of Dion. Editors of the Encyclopaedia Britannica. (2016). Hydraulis. Enclyclopaedia Britannica, Inc. Web. McKinnon, James W. Hydraulis. N.d. N.p. Web. 14 April, 2018. Acropolis Museum. (2018). A music trip through time with sounds of the ancient hydraulis. Acropolis Museum. Ministry of Culture. Web. 14 April, 2018.